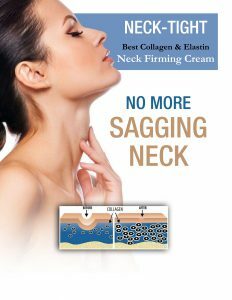 Lasting Looks Clinic Neck-Tight Firming & Repair Cream is a skin tightening wonder that uses peptides ingredients to specifically improve and maintain skins elasticity for a more youthful and tighter appearance. Skin starts to lose its elasticity the more you age. The skin’s natural ability to remain taught and recoil for a smooth and uniform appearance is slowly softened and released, resulting in loose skin and wrinkles. This is most noticeable around the lower jaw and neck. To resit this gravitational decline, the elasticity of the skin needs to be maintained and revived. With peptides added, this moisturizing Hyaluronic base, works by improving both the bonding of the skin layers and elastic resilience, while promoting healthy collagen growth to reduce wrinkled and loose skin.